Kolbe & Fanning have been augmenting their online bookstore, substantially expanding offerings of numismatic books for direct retail sale at fixed prices. 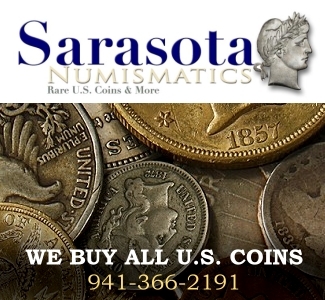 Their online bookstore, on the main Kolbe & Fanning website at www.numislit.com, currently includes over 1350 titles spanning the entire world of numismatics. While many numismatists associate Kolbe & Fanning strictly with auctions, our direct retail sales have been a growing part of our business, and it is an area we intend to develop more fully. The numislit.com site is easy to use, and is designed both for browsing and for more focused searches. Customers can use the Search box to look for specific subjects or titles, check out recent additions to the inventory, or browse entire categories of books by simply clicking on the relevant link. Titles offered include new publications, as well as the rare and out-of-print classics in which we specialize. Each title is illustrated and fully described. Customers may place orders through our secure server; creating an account is optional, but useful for customers who may place additional orders from time to time. PayPal and all major credit cards are accepted. One may also pay by check or money order. We’re currently planning a full website redesign that we will announce shortly; it will make the site much easier to use on handheld devices. Our intention is to offer a wide range of material appealing to various tastes. Prices range from $10 to $4000. Kolbe & Fanning are excited about developing this part of our business and invite you to check us out at www.numislit.com.